Earth Day rears its smiling, nervously optimistic head once again with Disneynature’s latest eco-doc Monkey Kingdom. Directors Mark Linfield and Alastair Fothergill have carved an impressive career of environmental documentaries, for both the large and small screen. Monkey Kingdom boasts the same skillful mixture of environmental grandeur and character-driven intimacy, and the film is as visually glorious as any in this series. Still, you have to wonder how many hours of wildlife footage is accrued before the filmmakers can impose a storyline on the proceedings. That is not to suggest the tale is entirely make believe. Monkey Kingdom rolls cameras in the jungles of South Asia, capturing the complex social structure of a macaque monkey troop. What unfolds is a kind of Cinderella story of the low-born Maya and her efforts to fend for herself and her newborn. The intricate pecking order sets the perfect stage for an underdog film full of scrap, perseverance and triumph. Narrator Tina Fey’s smiling, workaday feminism gives the film personality and relates it to humanity without having to even try. 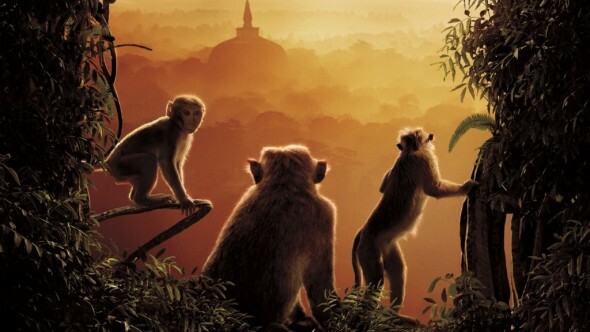 While the film keeps your attention throughout, Monkey Kingdom lacks some of the punch of other Disney Earth Day flicks. Linfield and Fothergill’s 2012 film Chimpanzee had the 5-year-olds at my screening sobbing breathlessly, whereas Monkey Kingdom might elicit a compassionate frown. Between the built-in drama of the “overcoming adversity” storyline and the occasional giddy monkey hijinks (the bit where the troop crashes a birthday party is particularly enjoyable), the film compels attention as it shares eco-savvy information kids may even remember. Documentary purists will balk at the anthropomorphized story, but families will enjoy this thoroughly entertaining film.